One thing I see and hear quite a bit of from customers is that they complain that their fuel gauge is inaccurate or acts very erratically. I’ve been dealing with these type of problems since I got into the business almost two decades ago. The one common factor in most of these complaints is the fuel level sensor. Late model fuel injected cars and trucks all have their fuel pumps located in the gas tank. There is also a fuel level sensor, or you may know it better as a ‘sender’. It holds the float assembly along with a resistor board that has small little metal ‘fingers’ that touch the board and send the signal to the fuel gauge to display the proper amount of fuel in the tank. What happens when the fuel gauge becomes erratic is that the little metal ‘fingers’ start to deteriorate from fuel additives, corrosion and just plain bad gas. Now, once there is any type of gap from a small amount of corrosion, these fingers start to touch the resistor board less and less which will send the wrong signal to the fuel gauge. Once this starts to get worse, there will be portions of the fingers that are barely touching and others that are kind of flopping on and off the board. This will send the crazy signal to the fuel gauge. This would be the time you see the gauge going from full to empty on it’s own, or usually after you fill up your vehicle it will act up from the sloshing around of the gasoline. This can get quite annoying, and will leave you not knowing how much fuel you actually have. These are the times people run out gas because the gauge showed more fuel than they had. Usually now is when they bring it in to the shop! I’ve replaced hundreds of these fuel level sensors, and every time I take one off I inspect the float arm and resistor board and metal fingers. Every single time, I can physically see the deterioration of the metal. Customers are especially happy to see this so they know what was causing their problem. Repairs like this aren’t usually cheap. Fuel level sensors on newer cars are usually 100 – 200 dollars just for the part, plus usually two to three hours labor depending on the vehicle, sometimes more. Getting this diagnosed is fairly easy. Just about every mechanic has seen this type of problem. Late model GM vehicles will usually set a trouble code for the fuel level sensor when there is a problem with it. If your car has a code for this, you definitely need a new sensor. The only bad thing is, there is really no way to completely stop this from happening. Running a good quality gasoline definitely helps and prolongs the life of fuel system components. Just keep in mind when you see your fuel gauge acting funny, get it checked out! You don’t want to be left on the side of the road, alone, and out of gas! Picture of the gas gauge sending unit inside the fuel tank. I’m looking for the location of a sensor on or near the gas tank. Fuel pressure sensor? It is a 2001 Pontiac Grand Prix. Do you mean the fuel tank pressure sensor? I’m guessing you have a check engine light with a code related to the sensor? Yes but i do not have that info with me.my ex says basically its the gas cap but that has been replaced. OK. The fuel tank pressure sensor is located on top of the fuel pump assembly, on top of the gas tank. But without knowing the code, i would not just go and have that replaced. There are codes related the the system that can be another parts problem. Most of the time when people think a bad or loose gas cap has caused the engine light, the problem is usually what is called the “EVAP system Vent valve”. He says that it might be a sensor. Where would i find this EVAP system vent valve? That is located inside the drivers side rear wheel well. Again, the code number is the key to deciding what part has failed. I will ask for the code and get back to you or some one else. thank you for your time. and know how. 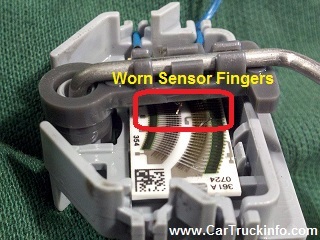 122 Comments on "My Gas Gauge Reads Empty When It Is Full Of Fuel"
The fuel sensor fingers come in two sets of three. Before installing my new pump one set of the sets broke, will it still monitor fuel levels with only one set of three fingers? My 2011 Elantra is showing the fuel low icon but the gauge is 3/4 full. Just filled recently. I have a 2005 Pontiac Sunfire and the gas gauge is stuck on empty, matter of fact it is stuck next to the 100 number on how fast the car is going. I put gas in it to make sure I have enough in it and it is always full it only takes a couple of dollars. How do I get if fixed and where can it be taken? Is it considered an old car? I don’t know any thing about cars as you can tell. Oh please tell me you can help with this mess!!! Why isn’t there an aftermarket for the fuel cap with a tube which would mechanically measure the amount of fuel in the tank? Or is there? Just filled up my 07 f150 and needle only reads half full? Whats my problem? Have 07 Chevy malibu. Replaced whole fuel pump assembly. Gage still going up and down,and check engine light on ,and off,please help. My gas gauge is inaccurate, and the car is hard to start sometimes without giving it gas. I can smell gas when I start it sometimes too. Any ideas? Have 1996 dodge van 2500 . The gate reads full all the time .Replaced whole fuel pump . Gate still reads full . Whats my problem ? I just got the fuel level sensor replaced on my ’08 Santa Fe today, but before I did the needle would move up and down. Now it only reads at 1/2 tank. Do i have to drive it around until it reads it correctly? I have a 95 Dodge Dakota Sport 3.9L it acted like I ran out of gas while driving. Put 4 gallons in, no start. Got it home, verified that I did have good spark at plugs and coil, tried priming with gas, nothing. Let it sit for an hour. Tried starting fluid, nothing. Cleared OBD codes (only had codes for EGR valve) and cleaned battery terminals and cable ends before putting them back on. charged up battery and added 2 more gallons to tank. Checked for fuel pressure at fuel rail valve, positive. Waited 4 more hours and it began to start but acted flooded, it cleared and ran good. Took the truck on three test drives, ran good. BUT I filled it up and could only put 6.2 gallons in the tank?? I’m almost positive this truck has a 16 gallon tank. Any ideas what would cause it to “run out of gas” when there should have been 4 gallons in it? Thank you for the information, this really helped me out understanding my problem. Love this site. I have a Yukon. I just filled it up and when I started it the gas gauge went to empty and low fuel light came on, but tank is full. Will I still be able to drive it until I can get it fixed or will it strand me?? You will be able to drive it just fine. A shorted wire is possibly the problem. Hi I just purchased a 2011 hyundai sonata and the gas gauge doesn’t tell me how much gas I have. The empty light keeps blinking..can it be the gas pump or sensor.. what can the approximate cost be for this? 2003 Saturn, L200, 2.2 L engine Service light is ON, Gas gauge shows empty but it isn’t, and Security light is ON. They didn’t come ON until I drove 20 miles down the road. What’s the problem? No, the fuel level sensor is attached to the fuel pump assembly, but does not effect the pump at all. I have an 08 Tahoe. We had our sensor changed (twice) and it is still not calculating the gas right. It will go from full to 1/2 in only a few miles or stay on full for a while then go right to half. My airbag light is on I was wondering if it may have something to do with the computer? 2000 Ford Explorer makes noise every now and then when I hit gas noise stops. Had fuel sender replaced one year ago. Is this going again? I have a 2013 Chevy cruze, I filled my tank up and it’s still stuck on empty and I’m not sure why is going on. This has happened before but the gauge started moving after I drive for a while. Could you tell me what is going on? I wanted to purchase a 2003 Chevy Impala but the check engine light is on I had it checked they said it’s the fuel level sensor my question after reading the forum is does that 52nd the Chevy would have a code since the check engine light came on or is that a easy fix! I recently was rear ended by another driver while stopped at a red light. Since the accident, my fuel gauge stopped working properly. It sometimes reads empty when full and full when not totally full. What’s up with that? My car keeps shutting off it don’t run hot.. The gas hand moves up and down when gas in the tank. How can ibfix this problem? I have a 2002 ford explorer v6 and everytime I full the car completely in till the gas handel clicks and cant take no more. Then I start the car and the gauge only goes 3/4 of the sT up but I know it’s full because the handel clicked to max. What could it be? I have a 72 Chevy pick up. I changed the complete float and sending unit. I also sent the tank out and got it cleaned. My problem is my gas gauge indicates more than full like twice as much. When I disconnect the wire to the gauge it indicate full. I have my tank full of gas. What is causing this strange reading? Why would my gas gauge go from full to 3 quarters of a tank over night just by sitting in my drive way. Fill up over the weekend did not drive tell monday 3 trips to same place then back home it was hott out the day i filled up and was hot out monday and when i got hone monday eveing about 350 gas guage showed full it was cool this moreing and noticed the drop in gas what coukd be going on? Fuel light is on but gas is spilling out. Put 10 dollars and it didn’t spill. Second time put 5 and it all spilled. Any ideas?? Is it possible I pour wrong gas? What about if you had a half tank and the next day showed a full tank? Either the mechanic did something wrong during the replacement, or the fuel sensor got damaged or is the wrong one. We have replaced the pump ,fuel sensor and the?? in the dash. we drove from Nebraska to Texas and back and still every time we fill the tank it will go to empty for a short time and repeat it over. The funny thing is if you honk the horn a couple times it will go back to full only to repeat again until you get down to 3/4 of a tank. What will it cost to replace the fuel sensor on my 2000 Pontiac Grand AM? What is involved for replacing fuel sensor on 1989 Buick century ? The fuel tank needs to come out of the car, then the fuel sender assembly gets removed from the tank. As long as there is not a lot or rust, the labor for this job is about 3 hours. I need a estimate of how much its going to cost to have my fuel pressure senor replaced on 06 impala. Estimate cost of fuel pressure regulator replacement is the part= $90, labor- 1 hour. I replaced my alternator , the car cut off and the gas level went to empty. When the alternator was replaced the gas level still says empty. I was told without looking at car to buy a fuel tank assembly but I don’t think I need that. If this problem started only after replacement of these parts, then you could have the wrong sensor, a broken wire or a bad sensor. 1979 chevy c 20 3/4 ton pickup .. topped off both tanks & the fuel gauge is now reading 1/2 full when i switch to either tank. simultaneous sender failure in both tanks or indicator problem in dash ? You need the fuel level sensor in the gas tank. I’ve got a 1999 Pontiac sunfire as my gas gets run down my gas gauge goes down but it stops at half a tank then starts to go back to full as I run more and more gas out what would cause this the same fingers ? Yes, the fuel level sensor is bad on your car. The resistor can burn up anywhere on the sensor or the fingers are corroded. Brian, I followed your instructions on a 2002 Pontiac Grand Am and IT WORKED!! so far anyway. I did this a few days after the gage was stuck on empty. I bought Gumout with PEA at Walmart. After the second fill up and second bottle of Gumout the gage returned to a full tank register! THANK YOU SO MUCH FOR THE TIP!! Thank you very much, your information help me to find out where the problem is!!!! !